Another year, another teenager excited to get a job. It is always an interesting time as a parent, helping your kid with the job search and learning to give up some part of your purpose of complete caregiver. Setting up to let go. They become adults. And just like every other time of transition and crisis in human development it takes adaptability and resiliency for all involved. My oldest son got his drivers and immediately that meant looking for a job. As a parent, my crisis lies in letting go and not imposing my desire to let him lead a carefree life. That is just not natural. And it is without true purpose. This stage of life defines our purpose in relationship again. And it is my third value in being a coach to others. The drive to do something is pretty powerful. We want to pursue and know that our pursuit is meaningful and true to who we are. As I considered these words in contemplation of our new state of fairs, I was reminded of my first job. I mean, I was always able to get money on the farm, and was pretty successful doing so. I could volunteer at church and the community, and there was some fulfilment in this. There were other things to do, so it was not just a way to fill time to keep me out of trouble. I wanted a real job, one that required a Social Insurance Number, and a time clock. This was true for everyone my age. So, I went to the local store, applied, and got the job. Started making money, loved the sense of importance I received, and enjoyed feeling responsible. Then it happened. I started having shifts while my friends were having fun, at the boss’ house of all places! I did not always get along with the boss, or was not able to do things the way the last guy did them. It was cramping my style. Within a few months I realized this was not what I wanted to do, it did not fit most of my likes or abilities, and made me more trapped than I could have imagined. I quit. I tried, and that was that. I learned from it. More than anything, how to keep working at something you really do not enjoy. But I would never have learned it if I had not tried. It was part of my experiencing the pursuit of purpose in life, and I see it time and again through all of my vocational ventures. 1. Sometimes it is simpler to participate in the functions of a role, and simply provide some form of continuity to what exists. 2. Sometimes it is easier to assume a role and hope that things remain the same in order that there will always be a place for us. 3. Sometimes it is more convenient to perform a certain task, and assume that there is no further meaning to what we are doing. 4. Sometimes it is more glorious to exaggerate what we already have, in order to keep people from desiring anything else. 5. Sometimes it is unsettling to venture beyond what we know is here. 6. Sometimes it is less scary to perpetuate what has been done in the past, not necessarily what works in the present, or will be best for the future. 7. Sometimes it is completely unknown to us why we do what we do, so we just do it! Purpose is really nothing more than a description or an acknowledgement of the direction you are heading. It keeps the train on the rails. By ‘acknowledgement’ we are stating what we have been doing up to this point, and may very well continue to do. Looking deeper into the practices we hold can give us some clarity in what we could be doing better, and how you view your relevance in a given situation. Passion is drive. If we do not have passion in what we do, then we may be filling someone else’s role. Passion cannot come without purpose, otherwise it is just a rudderless boat waiting for whatever wind will take your in whichever direction. 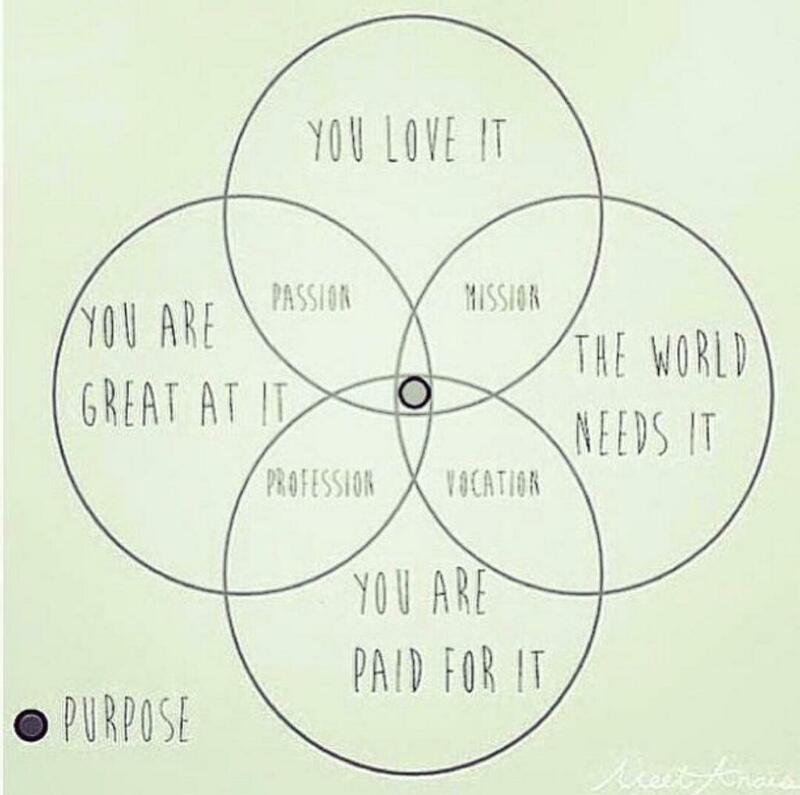 Using the diagram above, we see how we need both. If they do not fit, we need to revisit what we are working towards. Defining what drives you in this life is important. Even if you are a generalist and can do many things. Knowing why you do what you do can separate some of the distractions in your personal and working life.